I always look forward to going "home". I still think of home as being my parents' house where I grew up. And as I've gotten older and moved farther away, I've learned to truly value these visits home. This weekend's visit is extra special since it is Father's Day weekend. And for many dad's, it's a time for them to show off their grilling skills. Grilling can be a quick, easy and healthy cooking technique, but some planning may be required, especially if you're planning on using a marinade. In general, most meat and poultry need to be marinated for 1 to 3 hours; seafood needs 15 to 30 minutes. If you need part of the marinade for a sauce, be sure to reserve some before placing it with raw meat. Never reuse marinade on cooked food or you'll put yourself and others at risk for foodborne illness. Grilling doesn't need to be limited to just meat. Try grilling vegetables, breads, pizza dough, and even fruits. A grilled veggie sandwich tastes nothing like a cold veggie sandwich! Try slicing zucchini, yellow squash, mushrooms, red bell peppers, eggplant, and onion and toss with your favorite seasonings and equal parts olive oil and balsamic vinegar. A grill basket is the best way to not lose the veggies down your grill grates, but you can also skewer the veggies or wrap them in aluminum foil. Slice a baguette and grill the bread on a clean grate. When the veggies are tender and the bread is browned, assemble the sandwich and top with a slice of provolone cheese. Grilled fruits caramelize and produce a delicious sweet flavor. If you are grilling fruit, choose fruit that is firm, such as pineapple, mango or pear. Softer fruits may be more delicate and may break apart easily. Gas or electric grills are best used for grilling fruit to avoid a smoky, charcoal flavor. Always make sure your grill grates are really clean. There's nothing worse than tasting charred steak on peaches! My dad is a master griller and will likely be grilling at some point this weekend. I'll try to step in to take the reins to give him a day off on his special day, but I doubt he'll let me. I recently fixed this grilled shrimp recipe along with a mango salsa, grilled potatoes and spicy kale. Delicious!! Soak bamboo skewers in water for 30 minutes to prevent from burning. In a medium bowl, whisk oil, rosemary, lemon zest, garlic, black pepper, salt and cayenne pepper until combined. Add shrimp and toss to coat. Marinate in the refrigerator for 30 minutes. Skewer shrimp on bamboo skewers. Prepare an outdoor grill. 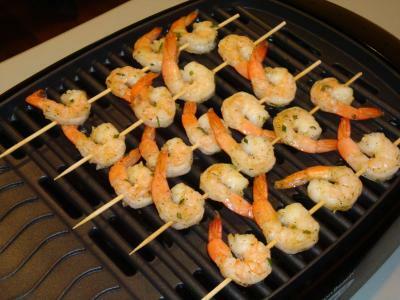 Grill shrimp 3 minutes per side until just cooked through or when turn opaque.